Works with ceramics since the late 70-ties. Has a close collaboration with Åke, my husband and colleague. Workshop/studio, showroom and our home is in Barlingbo, south east of Visby on the Swedish island Gotland, in the middle of the Baltic Sea. 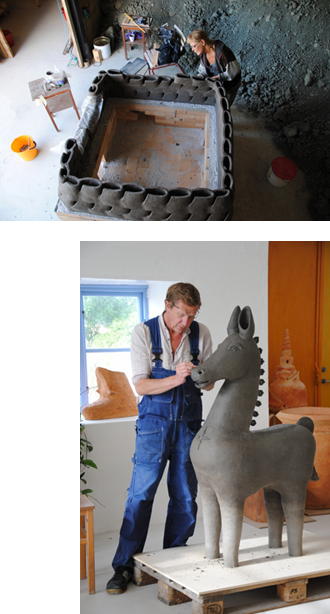 Interior design ceramic for both indoors and outdoors constitutes a great part of my work. Ceramic tile for public place, ceramic furniture and sculpture. Works with ceramics since the early 80-ties often together with my beloved, Eva Nobling. Works with ceramic for interior design, for both indoors and outdoors. Tiled tables and ceramic furniture. Big urns and sculpture. Established our first own workshop in the northen part of Sweden in 1984. The first years we also worked as art teachers, travelled much to India to learn more about South Indian sculpture technique. In 1996 we moved to Gotland. Today we have a big intrest in organic material in clay for sculptural work. The last years we have been project leaders for an EU financed project dealing with new techniques for ceramic sculpture. KIF, KHVC, BUS and Nyteks.